The Rosetta Stone on display in Room 4. What is the Rosetta Stone? The Rosetta Stone is one of the most famous objects in the British Museum. But what is it? 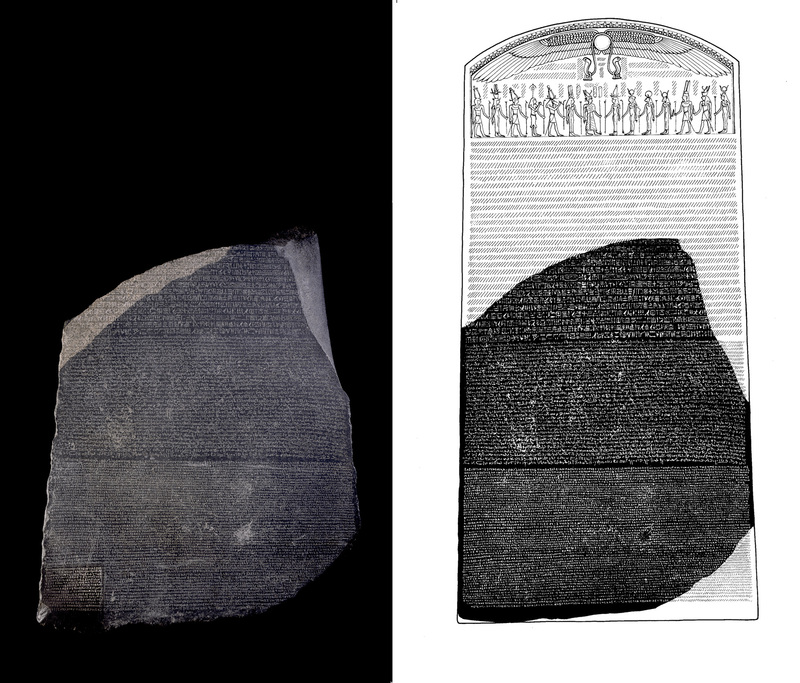 The Rosetta Stone and a reconstruction of how it would have originally looked. Illustration by Claire Thorne. The Stone is a broken part of a bigger stone slab. It has a message carved into it, written in three types of writing (called scripts). It was an important clue that helped experts learn to read Egyptian hieroglyphs (a writing system that used pictures as signs). The writing on the Stone is an official message, called a decree, about the king (Ptolemy V, r. 204–181 BC). The decree was copied on to large stone slabs called stelae, which were put in every temple in Egypt. It says that the priests of a temple in Memphis (in Egypt) supported the king. The Rosetta Stone is one of these copies, so not particularly important in its own right. The important thing for us is that the decree is inscribed three times, in hieroglyphs (suitable for a priestly decree), Demotic (the native Egyptian script used for daily purposes, meaning ‘language of the people’), and Ancient Greek (the language of the administration – the rulers of Egypt at this point were Greco-Macedonian after Alexander the Great’s conquest). Detail of the hieroglyphs, including a cartouche featuring the name Ptolemy (written right to left, along with an Egyptian honorific). Detail of the Demotic section of the text. Detail of the Ancient Greek section. You can make out the name Ptolemy as ΠΤΟΛΕΜΑΙΟΣ. The importance of this to Egyptology is immense. When it was discovered, nobody knew how to read ancient Egyptian hieroglyphs. Because the inscriptions say the same thing in three different scripts, and scholars could still read Ancient Greek, the Rosetta Stone became a valuable key to deciphering the hieroglyphs. Napoleon Bonaparte campaigned in Egypt from 1798 to 1801, with the intention of dominating the East Mediterranean and threatening the British hold on India. Although accounts of the Stone’s discovery in July 1799 are now rather vague, the story most generally accepted is that it was found by accident by soldiers in Napoleon’s army. They discovered the Rosetta Stone on 15 July 1799 while digging the foundations of an addition to a fort near the town of Rashid (Rosetta) in the Nile Delta. It had apparently been built into a very old wall. The officer in charge, Pierre-François Bouchard (1771–1822), realised the importance of the discovery. 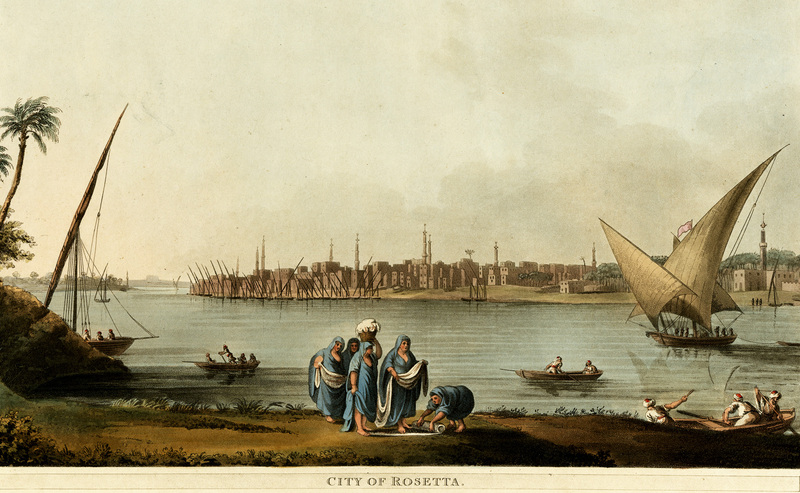 The city of Rosetta around the time the Rosetta Stone was found. Hand-coloured aquatint etching by Thomas Milton (after Luigi Mayer), 1801–1803. On Napoleon’s defeat, the stone became the property of the British under the terms of the Treaty of Alexandria (1801) along with other antiquities that the French had found. The stone was shipped to England and arrived in Portsmouth in February 1802. Soon after the end of the 4th century AD, when hieroglyphs had gone out of use, the knowledge of how to read and write them disappeared. In the early years of the 19th century, scholars were able to use the Greek inscription on this stone as the key to decipher them. Thomas Young (1773–1829), an English physicist, was the first to show that some of the hieroglyphs on the Rosetta Stone wrote the sounds of a royal name, that of Ptolemy. 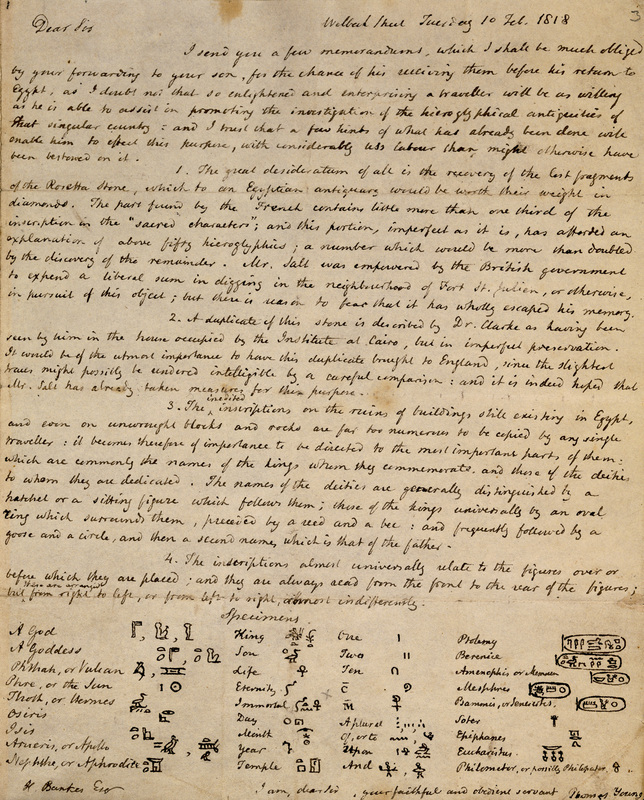 A letter from Thomas Young about hieroglyphs, written on 10 February 1818. The meanings he suggests for these groups are mostly correct, but he was unable to analyse how the signs conveyed their meaning, and they are little more than highly educated guesses! The French scholar Jean-François Champollion (1790–1832) then realised that hieroglyphs recorded the sound of the Egyptian language. This laid the foundations of our knowledge of ancient Egyptian language and culture. Champollion made a crucial step in understanding ancient Egyptian writing when he pieced together the alphabet of hieroglyphs that was used to write the names of non-Egyptian rulers. He announced his discovery, which had been based on analysis of the Rosetta Stone and other texts, in a paper at the Academie des Inscriptions et Belles Lettres at Paris on Friday 27 September 1822. The audience included his English rival Thomas Young, who was also trying to decipher Egyptian hieroglyphs. Champollion inscribed this copy of the published paper with alphabetic hieroglyphs meaning ‘à mon ami Dubois’ (‘to my friend Dubois’). 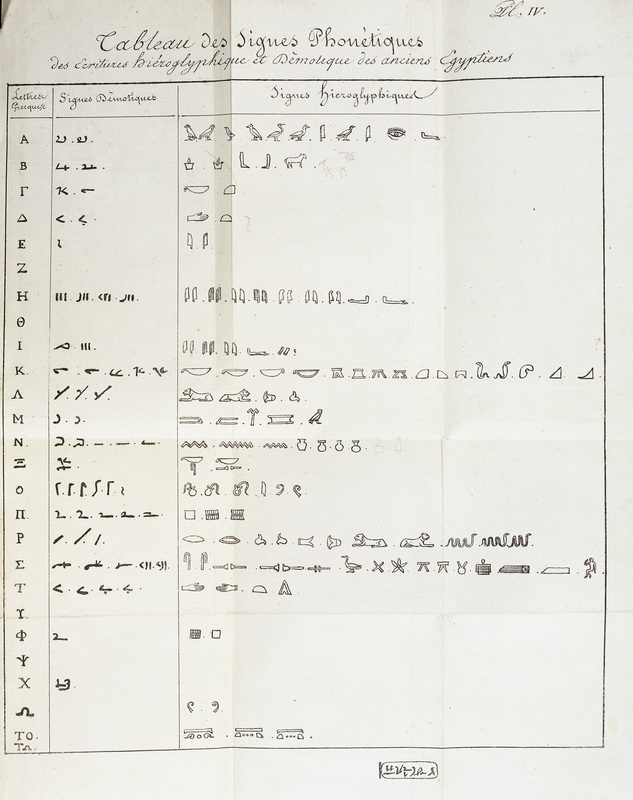 Champollion made a second crucial breakthrough in 1824, realising that the alphabetic signs were used not only for foreign names, but also for the Egyptian language and names. Together with his knowledge of the Coptic language, which derived from ancient Egyptian, this allowed him to begin reading hieroglyphic inscriptions fully. What does the inscription actually say? The inscription on the Rosetta Stone is a decree passed by a council of priests. It is one of a series that affirm the royal cult of the 13-year-old Ptolemy V on the first anniversary of his coronation (in 196 BC). You can read the full translation here. In previous years the family of the Ptolemies had lost control of certain parts of the country. It had taken their armies some time to put down opposition in the Delta, and parts of southern Upper Egypt, particularly Thebes, were not yet back under the government’s control. Before the Ptolemaic era, decrees in hieroglyphs such as this were usually set up by the king. It shows how much things had changed from earlier times that the priests, the only people who had kept the knowledge of writing hieroglyphs, were now issuing such decrees. The list of the king’s good deeds done for the temples is interesting. It hints that this was a way for the pharaoh to ensure the priests’ support for the regime. After the Stone was shipped to England in February 1802, it was presented to the British Museum by George III in July of that year. The Rosetta Stone and other sculptures were placed in temporary structures in the Museum grounds because the floors were not strong enough to bear their weight! After a plea to Parliament for funds, the Trustees began building a new gallery to house these acquisitions. 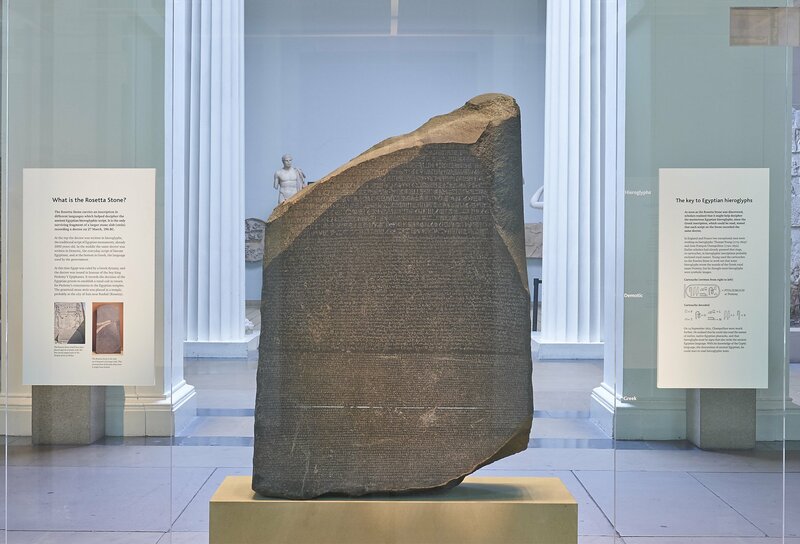 The Rosetta Stone has been on display in the British Museum since 1802, with only one break. Towards the end of the First World War, in 1917, when the Museum was concerned about heavy bombing in London, they moved it to safety along with other, portable, ‘important’ objects. The iconic object spent the next two years in a station on the Postal Tube Railway 50 feet below the ground at Holborn. Can’t get enough of the Rosetta Stone? You’re in luck. Our shop range features everything from memory sticks and umbrellas to ties and mugs! You can even take home a replica of this iconic object. Want more Rosetta Stone facts? Take a look at Curator Ilona Regulski’s blog, where she shares her experience of becoming the latest custodian of the Rosetta Stone. Find out more in this BBC podcast about the Rosetta Stone.